Photo: Mark EwingIt was something of a surprise when Alesis announced the 'analogue' successor to their flagship polysynth, Andromeda. 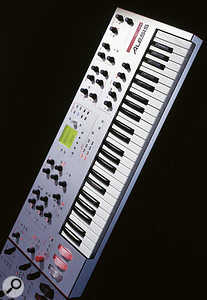 It was not to be, as many hoped, a cheaper spin-off of the same technology, but a DSP modelling synth instead. 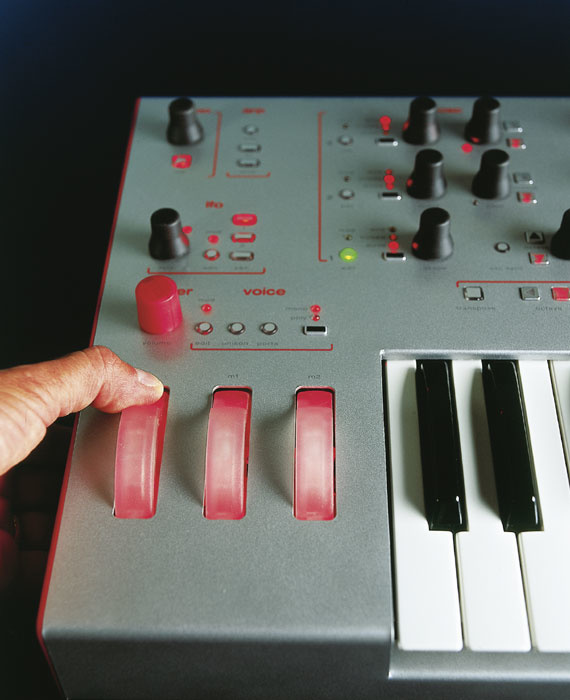 The Andromeda (reviewed SOS April 2001) was a daring experiment: a modern analogue keyboard-based megasynth, seemingly designed by committee and with a plethora of features to befuddle us elderly gentlemen raised on Jupiters and Prophets. On my first encounter with it, I remember gazing helplessly over its complex facade and wondering where to start. In contrast, the Ion's spacious panel is much less intimidating and, although it hasn't a true analogue bone in its body, any major compromise in sound is hard to spot except, inevitably, in the minds of those for whom analogue will always be best. The Ion looks striking; perhaps suggesting a certain Waldorfian character with its red and silver colour scheme and chunky 360-degree, high-resolution pots. There are 30 of these dark, rubbery, grabbable beasties, the only significant drawback being the single set of envelope controls shared by filter, pitch/mod and amplifier. The knobs feel great, but the buttons — 70 of them — are (very) small and feel rather cheap. The front-panel legending is rather small for my eyesight, and this is worse in low lighting conditions. This point aside, however, the Ion looks great in a dimly lit environment with its many useful indicator LEDs. Some of the LEDs are built into buttons and can change in intensity according to underlying parameter values. Thus, transposing the oscillators from zero by up to three octaves generates a progressively brighter red from the Up switch indicator. And while we're discussing impressive visuals, the three performance wheels are also backlit, and may be configured to grow brighter as you move them. Because this looks lovely, it is the default action — but you can have them constantly backlit if you prefer it. The 160x160 LCD is fine but, because the synth is perfectly flat with no raised control panel, I found myself stooping far over the keyboard in order to see it properly. Nevertheless, page and 'soft' keys guide you through the various menus and the use of graphics is very informative throughout, especially when displaying envelope curves and waveforms. There are many parameters for which there are no dedicated controls, so strategically placed Edit buttons (backlit in green) access additional options. Data entry is performed via a combination of 'soft' buttons and a notched clear plastic pot. This data-entry knob doesn't always perform intuitively, requiring clockwise turning to increase values, step on through patches, and so on, but anti-clockwise turning within some menus (to progress through the mod matrix slots, for example). Overall, I found the panel design a bit of a mixed bag. I liked the large knobs and found the space between them to be generous, but the layout seemed a little eccentric. For example, oscillators, mixers and filters are numbered not from the top of the panel but from the bottom, although the two LFO buttons are placed in the conventional order. Then there's the positioning of the envelope mode selector buttons behind the knobs, meaning you must reach your fingers over them to select which of three envelopes are active. Whenever you touch a knob, the screen displays the relevant menu, as if you had pressed an Edit button. As this behaviour is not something you'd always want, it can be turned off globally — but then you lose the handy display of values for cutoff, resonance and so on, until you specifically enter an Edit menu. I think a better solution would be for the various menus to time out automatically and return to the Home screen after a few seconds (you can do this at any time by pressing the Home button — located, inconveniently, close to the top of the panel). Turning to the keyboard for a moment, it is an insubstantial four-octave affair with velocity and release-velocity action — but sadly no aftertouch. You can assign Mod Wheel 2 to transmit aftertouch as a limited compromise. The synth's rear features stereo audio outputs, two additional outputs, control and sustain pedal inputs, the ubiquitous MIDI trio and also stereo audio inputs. All audio ins and outs are 24-bit balanced, and power is courtesy of a standard IEC 'kettle' connector. Alesis have given the Ion considerable DSP muscle courtesy of a combination of processors. The main CPU is a 32-bit Motorola Coldfire and nine further DSP chips of Alesis' own design (one for each voice plus one for the effects) work together to form a sound engine running at 500MIPS (Million Instructions Per Second). So how does this translate to real-world features? Well, the Ion boasts just eight notes of polyphony and four-part multitimbrality, so you probably won't be creating monster layered patches or writing full songs on it — not without overdubs, anyway. Alesis have concentrated on sound quality first and foremost — and if that means a synthesizer with only eight voices, so be it. First impressions are important, and, compared to other virtual analogues in its class, the Ion's raw sound might not immediately grab you. 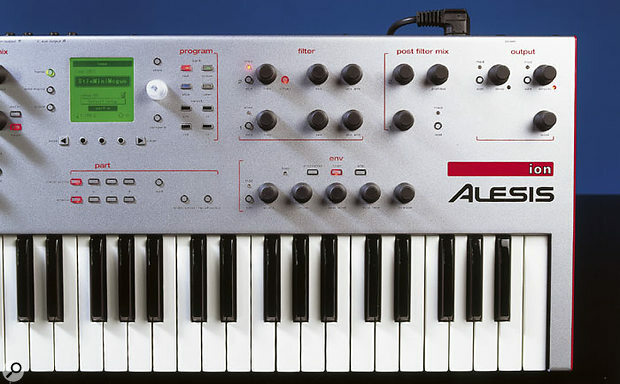 It's curious that Alesis — of all companies — chose to bestow such a limited effects processor upon their new synth. There's no reverb and the delay is hardly worth speaking of (don't worry though, I will). Indeed, it was only when I got the Ion into my studio and began in-depth analysis of its sound alongside an array of real analogues that I started to get impressed. And, after a few days, I was very impressed. 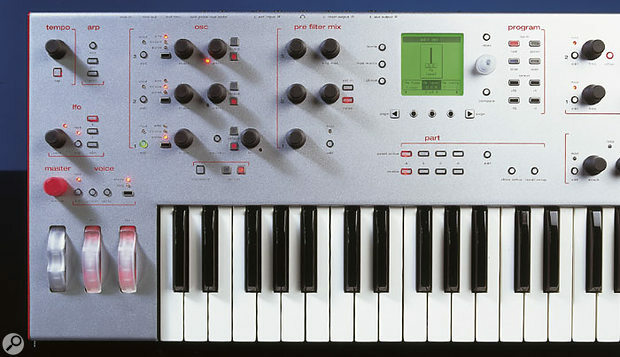 All the front-panel knobs transmit data so that it can be recorded by a sequencer; specifically, it is MIDI NRPNs (Non-Registered Parameter Numbers) that are sent. Whilst more editable than a stream of system-exclusive data, this does create its own problems for those of us who like to play around with sequencers — or simply edit controllers by redrawing a few curves in Cubase. An example will best illustrate why I find NRPNs frustrating. First, turn the Ion's 'Cutoff1' knob and record its output. You will see that, as you turn the knob, four MIDI controllers are generated. These correspond to the parameter identifier in LSB and MSB format (ie. Least Significant Byte, CC98; Most Significant Byte, CC99) plus the actual data. Again, this is in LSB and MSB format — data entry being a combination of controller numbers 38 and 6. When your tweaking involves the turning of a single knob, you can easily find the data-entry curves in your sequencer and make edits — but how about if you turn several? All those nested data-entry controllers become a total mess in such a situation — but on the plus side, they do allow a greater resolution than standard MIDI controllers with their range of values from 0-127 only. One way to make your tweaks more editable is to use the modulation matrix to 'remap' specific MIDI controllers to those functions you wish to control remotely — but it's a bit of a drag if you like to do this sort of thing a lot. The Ion has three oscillators per voice, each with continuously variable waveshapes. Select a square waveform and the waveshapes available range from a narrow pulse to a full, hollow square wave. The sawtooth varies from positive saw, through triangle, to negative saw, and the sine wave changes to a 'deformed sine' that adds higher harmonics. All the waveforms are shown graphically on the display. Each oscillator's pitch may be transposed in octaves (within a range of ±3), semitones (±7), or may be fine-tuned in half-cent intervals (a cent is one percent of a semitone). The oscillators sound great, especially when subtly detuned against each other, and they offer several noteworthy features to cause envy amongst rivals. Firstly, oscillator sync is available in hard or soft modes. Hard sync is the one we're all familiar with, where the sync'ed oscillator resets its waveforms in line with the master. With the Ion's soft-sync implementation, the slaved waveform reverses direction whenever the master waveform begins its cycle, resulting in a wave with no sharp edges and a different mixture of harmonics. Oscillator 1 is always the master and either Oscillator 2 or both Oscillators 2 and 3 may be sync slaves. The second spicy feature is an impressive FM implementation with three algorithms available that modulate the oscillators in various configurations. There's 3>2>1 (where Oscillator 3 modulates Oscillator 2, which in turn modulates Oscillator 1), 3>1<2 (Oscillator 3 and 2 modulate Oscillator 1) or 2>1 (where Oscillator 3 plays no part in FM). FM may be either linear or exponential, and it has a dedicated level control for instant gratification. The oscillators pass through a pre-filter mixer stage along with noise (selectable from white or pink), ring modulation (using Oscillators 1 and 2) and the external audio input. As with almost everything on the Ion, this mixer isn't as simple as it might appear. The synth has two filters per voice, so the mixer menu is the place to decide how much of each audio source to route to each filter — with the default setting being to send equal amounts to both. Since the external audio signal is a stereo source, the routing is a balance. In its 'middle' setting, the left channel goes entirely to Filter 1 and the right channel to Filter 2. Altering the balance allows the signals to be sent to either of the two filters in the amount you desire. A further choice in the mixer menu routes the output of Filter 1 into Filter 2, so you can cascade them in series. There are yet more signal routing options to discuss, but as they happen after the filter section, we'll head straight into that first. The Ion has superbly controllable envelopes, and editing them via the display is simplicity itself.Photo: Mark EwingAlesis have really gone to town on the Ion's twin filters, with no less than 17 different types available to each, plus a bypass option. If I list them all, you must promise not to drool on your magazine (or keyboard, if you're reading this on the SOS web site). The full list can be found in the box below. Each filter has a dedicated bi-polar envelope amount knob and the Edit menu provides a graphical representation of all settings via on-screen sliders (with filter frequency displayed in Hz), plus a further option — key-tracking. Finally, Filter 2 has an offset function. When enabled via its button, this ties the frequency of Filter 2 to a fixed offset from that of Filter 1. In this case, adjusting Filter 1's cutoff sweeps both of them. If the wonders of the Ion's filters seem complete, there is still the not-insignificant matter of the Post-Filter Mixer to examine. This useful little extra determines the amount of each filter that will be sent to the output stage and the panning of each of them in the stereo field. And there's more, because at this stage, you can introduce a 'Pre-Filter' signal back into the mix. The source is selectable from any of the oscillators, the ring modulaton, noise source, or even the whole 'pre-filter' input mix. With dedicated knobs for each mix signal, too, this is pant-wettingly good fun (forgive me; I don't get out much). The Ion's manual is careful not to name the specific synths on which its various filters are modelled, but if I borrow some of its language, and you look closely at the two-letter names for the various types, you should find it pretty easy to guess. 'mg': a four-pole low-pass modelled on that of the most famous monophonic analogue synth ever made. 'ob': a two-pole low-pass closely resembling the one in a classic synth xpander... whoops, I mean expander module. 'rp': a four-pole low-pass modelled on the one in a popular semi-modular synth. 'tb': a three-pole low-pass (think 'little silver bass synth'). 'Eight-pole low-pass': all the filters from here on were created for the Ion; this one gives a very steep cutoff. '8ve dual band-pass': two two-pole band-pass filters spaced one octave apart. 'six-pole band-pass': like an exaggerated version of the 'ob' band-pass. 'phase warp': an analogue phaser effect based on eight all-pass filters in series. 'comb filter 1': multiple resonant peaks and notches which are not harmonically related. 'comb filter 2': as above, but the signal is additionally filtered to warm up the sound. 'vocal formant 1': three band-pass filters emulating 'ah' and 'oo' vowel sounds. 'vocal formant 2': as above, but 'oh' and 'ee' vowel sounds. 'vocal formant 3': a five-band formant filter. 'band limit': a two-pole high-pass filter and a two-pole low-pass filter in series, limiting the signal to everything between them; resonance adjusts bandwidth. That's quite an impressive collection — imagine the hardware required to build a polyphonic analogue synth containing that lot! There are some beautiful filters here, ranging from the (A)RP low-pass that clips when it gets a loud input level, to the delightful phasing filter and the expressive vocal filters. They all respond smoothly, with only the maximum resonance settings (in some cases) proving a little harsh and digital-sounding. And with two such flexible filters to play with, you are not reduced to merely emulating such classics as Moogs, Oberheims, Jupiters and so on, but can go where no-one has gone before. Perhaps this truly is the first of the next generation of Virtual Analogues? Three envelopes, two LFOs and separate Sample and Hold serve as familiar modulation sources, but there are even more available within the modulation matrix. Accessed via a dedicated button to the left of the display, 12 totally free modulation connections may be made for each program. You can use them to dynamically control waveform pitch and shape (for all waves, not just the square wave), filter routing, panning, frequency, mixer settings, effects and more. Modulation parameters include: source (36 choices plus MIDI controller numbers 1 to 119), level, and destination (78 of them!) plus an additional modifier — offset. With this, you can add a fixed offset — positive or negative — to the destination value. In a nutshell, the Mod Matrix is a cracker and covers virtually everything you could expect to see. It's so comprehensive it can hold its head high next to classic synths such as the Oberheim Xpander — especially given the inclusion of exotica such as a 'tracking generator'. The purpose of this is to remap a modulation source (for example the mod wheel, a note value, or velocity) to produce a warped, decidedly non-linear output. In practical terms, you might use it to create unusual pitch variations over certain areas of the keyboard or to rescale a MIDI controller so that it only starts to act after exceeding a specific value. Such concepts are far easier to grasp after a little hands-on time, but for the experimentally inclined, they're a godsend. All the waveforms of both LFOs are simultaneously available in the modulation matrix. These waves include the expected sine, triangle, sawtooth and square along with phase-shifted versions of each. Additionally, totally random modulation sources are on hand as well as sample and hold. Most S&H implementations on modern instruments sample a noise waveform to produce a random output, but the Ion's S&H adopts a more versatile approach. 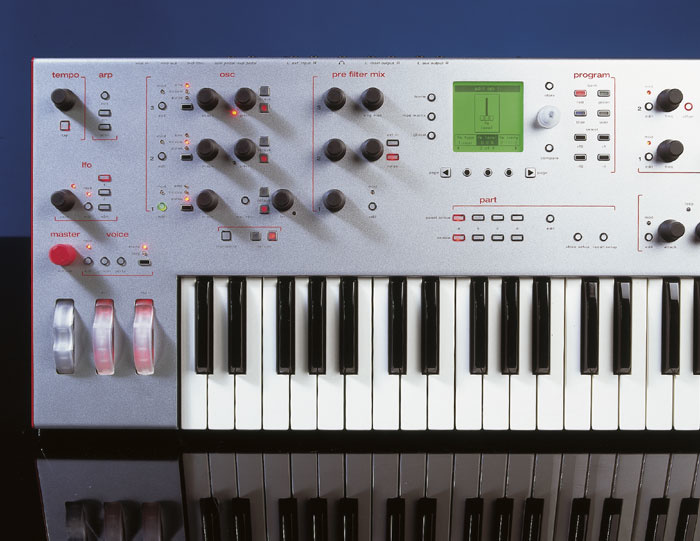 It can sample sources such as note velocity, LFO waveforms, MIDI controller numbers, envelopes and the tracking generator output, again reminding us of the Oberheim Xpander. There's a smoothing parameter, and the S&H-rate, reset-on-note, and sync-to-MIDI-Clock parameters are comprehensively programmable, as with the LFOs. If the S&H and the LFOs have a fine spec, then the envelopes are damn near perfect. Indeed, the Ion has my favourite envelope implementation ever, of any synth I've had in my studio. There's only one fly in the ointment; there's just a single set of hardware controls for all three envelopes. This aside, why are the envelopes so good? Well, for a start, you've got control over the slope of the attack, decay and release components of the envelope independently — with a choice of linear or exponential curves (positive or negative). The envelope times range from a snappy 0.5ms to a languid 30 seconds for attack, decay or release time. Better still (and reminiscent of the Chroma Polaris) if you set the release to maximum, it enters Hold mode, sustaining indefinitely. All envelopes should do this! You'll note that the envelopes have five knobs rather than the traditional four. The extra stage is a sustain time — so you can have the sustain level gradually die away to nothing if you like — or set it to maximum for behaviour like a standard ADSR. And we're not finished yet! Envelopes may be programmed to 'free-run', which means they pass through an entire attack-and-release phase, regardless of how long you hold a key. This is ideal for triggering spot effects, especially when you want to create a long, evolving sound without tying up your hands to do it. The envelopes can reset at zero whenever a key is played or work in legato mode, where they carry on from their previous level on hitting a new note. This latter is great for monosynth emulations. Finally, envelopes may be set to loop, and there are various modes available. One of these involves looping the attack and decay portion for as long as you hold down a note — or forever if the envelope happens to be set to 'free-run'! The manual advises you not to do this accidentally for the amplifier envelope; if you do, you can then only kill the note by playing enough non-looping notes to steal the voice. As I didn't read the manual right away [you shock me, Paul — Ed], I found this behaviour rather disconcerting, stumbling across a scenario where an envelope continued to loop even when looping was deactivated. To briefly summarise: the envelopes are awesome! Having one of them freely assignable (the 'pitch/mod' envelope) in combination with the Modulation Matrix allows for completely different envelope shapes for each filter. Or you can perform such cool tricks as fading a signal between the filters using the mod envelope whilst doing traditional filter sweeps with the filter envelope. This is not a synth you're going to explore fully in a few days — or even a few months! With four colour-coded banks of sounds — 512 patches in total — the Ion has plenty to audition. The banks are titled Red, Green, Blue and Yellow, and the last of these is supposedly the user bank, but this is slightly misleading, as all the banks may in fact be overwritten with user patches. Patch locations follow roughly the same order in each bank, starting with synth bass and leads and ending with sound effects and percussion. For multitimbral play, there are 64 Setup locations that refer to (up to) four patches, each with their own MIDI channel, output routing and panning, high and low key ranges, effects level, transpose settings and response to the mod wheels. Each of the four parts in an Ion Setup (labelled A-D) may be enabled or disabled via dedicated front-panel buttons located below the display; a second row of buttons denotes which part is currently active for editing (only one at once). With careful use of panning, each part can be routed to its own output if necessary. I was struck by how fat and 'American' the Ion sounds when compared to other modelled analogues I own. And its bass can be as warm or as cutting as the best of my analogue monosynths too — always a good test. It may be modelled analogue, but carefully audition a few of its patches and then tell me whether you care! Alesis have clearly put a lot of effort into minimising digital artifacts and the result is one of the most organic-sounding DSP-based instruments yet. For some of my favourites, see the box below. One slight gripe — whilst playing some of these patches, I really missed having an aftertouch-enabled keyboard and, despite being no Keith Emerson, I started to find the Ion's a little light. Also, its flat, squarish shape leaves the keyboard indented slightly and my sloppy fingers often hit the panel as I hurtled in typical careless fashion towards the highest note. Here are just a few of the Ion's factory sounds I particularly liked — many of them from bank Green, as it happens. Red, 041: 'Clusters' — a resonant, string-like pad making good use of the Phase Warp filter. Green, 003: 'J00p1t3r' — very analogue and Jupiter-like, and lovely at the bass end. Green, 010: 'Mini Classic' — a lovely solo patch for those 'where's my cape?' moments. Green, 018: 'Porta Lead' — another marvellous, warm lead. Green, 030: 'Aeon Choir' — this uses the two-pole high-pass and warp filters to produce a lush vocal texture. Green, 051: 'Profit Strings' — my Prophet 5 never sounded quite this good. Green, 052: 'Violacoder' — a stunning vocalised solo string that makes great use of the 40-band vocoder. Green, 081: 'E.P.?O.K.!' — this virtual analogue synth can also do electric pianos, organs, clavs and so on. This was my favourite of the pianos. Blue, 021: 'Phase Pad' — OK, I'm a sucker for these warm pads. Blue, 058: 'AbitOffTheTop' — a zappy, brassy, Xpander-like patch. User, 058: 'Kugel Flugel' — a simple brassy sawtooth, but very usable. Add a splash of external reverb or delay to this lot, and you're ready to gig. In contrast to the generous options in its synthesis engine, the Ion's effects offer slim pickings. This was a surprise — and a disappointment given Alesis' undoubted history in this field. Each of the four parts has its own modelled Drive effect selectable from six types: 'Compressor', 'RMS Limiter', 'Tube Overdrive', 'Distortion', 'Tube Amp' and 'Fuzz Pedal'. These do an adequate job of boosting and dirtying things up, but I probably wouldn't have pined had they been omitted entirely. The Master effects are slightly more interesting, consisting of the following types: 'Super Phaser', 'String Phaser', 'Theta Flanger', 'Thru Zero Flanger', 'Chorus', and 'Slap Back'. Some of them sound particularly analogue and convincing — especially the flangers — but there are no reverbs, and the only pure delay effect ('Slap Back') — has a maximum time of just 80ms, rendering it useless for echo duties. Quite why Alesis couldn't have added one of their cheap multi-effects chips at the end of the signal chain, I don't know, but at least the effects parameters, such as they are, are present in the Modulation Matrix. Also included in this section is a 40-band vocoder. 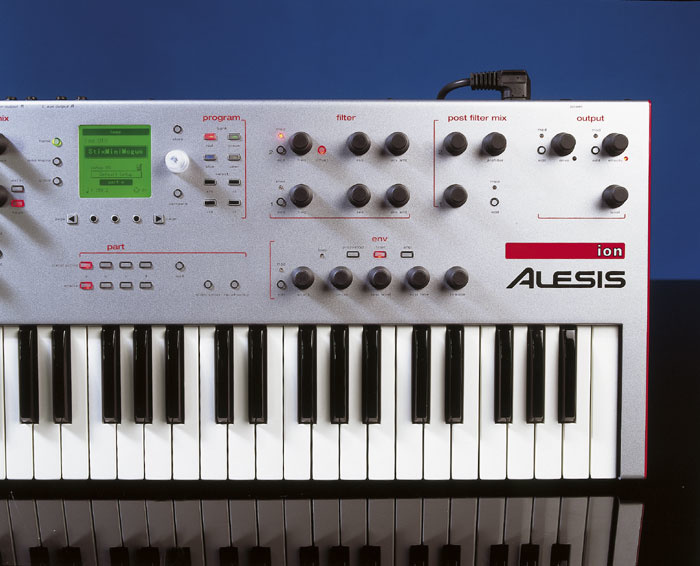 So many synths include these today that it's easy to overlook them, but Alesis have provided a generous selection of tweakable parameters and routing, enabling you to process the synth's own signals or use the stereo audio input to provide both the source and carrier signals to drive it. Some example patches in the (Yellow) User bank were perfect starting points and, overall, the vocoder does a splendid job. Don't expect Novation-style effects per multitimbral part, as Alesis have spent their DSP currency elsewhere. Thus, all Master effects settings refer to part A of a multitimbral setup only; parts B-D have merely a send amount. It's great to see dedicated buttons included for Unison mode and mono/polyphonic operation, and the portamento settings in the Voice Edit menu are comprehensive, as I came to expect from the Ion. You can choose from portamento or glissando with either a fixed or scaled rate — in other words, you can choose whether the time to glide between notes is the same regardless of their distance apart or whether it should vary according to the interval. Portamento can be set to work on all notes, or just on those played in legato fashion. Also in this menu is a pitch-wheel option by means of which the wheel may be set to operate on all notes or just held notes — a handy performance feature. Then there's 'analogue drift'; a means to make your perfectly-tuned digital synth behave like a temperamental box of old-fashioned circuits. Setting this to extremes, I was able to recreate an almost exact replica of my Jupiter 6 before I've had a chance to hit its Tune button. Photo: Mark EwingAt the top left-hand corner of the panel (not traditionally the location for such a performance tool) is the arpeggiator. 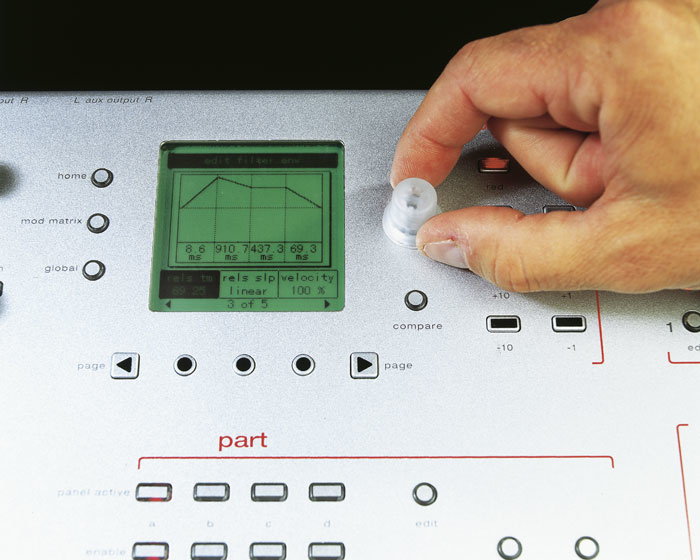 Its interface consists of a tempo knob and a tap-tempo button that also serves as visual tempo indicator, courtesy of its integral LED. Buttons to enable and latch the arpeggiator are provided too, and the associated LCD-based Edit menu offers access to 32 preset patterns complete with settings such as arpeggio length, range, span (in other words, whether arpeggios go above, below or above and below the base notes) and note order. Alesis have raised the bar in terms of what we should expect to hear from future modelled analogue instruments. The Ion's rich, warm tones, its many varied filters and versatile signal routing, the powerful modulation matrix and marvellous envelopes all add up to a synthesizer that even the most nerdy analogue anorak cannot simply dismiss as cold and digital. Sometimes the user interface delights, at other times it frustrates. I loved the knobs, disliked the buttons, loved the wheels but wasn't keen on the feel of the keyboard and the angle of the display. In the end, though, whether or not I like an instrument always boils down to the sound. When this is right, I find you can forgive practically everything, and, despite its surprisingly limited effects implementation, the Ion delivers beautifully in the sonic department. How it will sell in music stores, perhaps standing next to polished, more polyphonic competitors such as Novation's KS series, I can't predict. But it deserves to do well, especially with those of us who really enjoy getting in deep and exploring. Problems were remarkably few given the early version of the operating software (v1.0). I noticed the occasional 'crack' when playing some patches — this is possibly caused by the free-running nature of the oscillators (apparently, a future OS upgrade should add an option to reset the oscillators' phase when a note is played). I also managed to crash the Ion by recording too many knob twiddles into Cubase and playing them back again. I sent Alesis a MIDI file of my wild excesses, whereupon they quickly spotted the bug at fault. The plan is that an upgrade to fix this particular problem should be available by the time you read this, but if your music is of the controller-heavy type, try before you buy. Aside from these niggles, and my initial confusion with envelope looping, the Ion performed well. The factory sounds are, on the whole, good, but it's when you start programming your own material that the instrument makes you grin and mutter 'aha' a lot. In fact, if I didn't already own a stack of DSP synths, the Ion would probably be part of my collection by now, and if Alesis release a rack version, I doubt I'll be able to resist. After all, none of my ageing analogues are getting any younger, and the Ion's range of Moog, Oberheim, Roland and ARP sounds is very convincing. What's more, the Ion's exotic vocal textures and comb and phasing filters offer the potential for much more tonal tinkering than any of its immediate rivals. If you are looking for a modelled analogue synthesizer and put sound and flexibility above polyphony and effects, you owe it to yourself to spend time with the Ion. The sound — this is simply the best virtual analogue recreation yet. So much flexibility — in the envelopes, signal routing, and modulation options. The wheels light up (hey, these are my pros, OK?). Eight-note polyphony doesn't compare well to its rivals. Keyboard is very light and lacks aftertouch. Position and angle of display could be better. A synthesizer that can sound like a living, breathing chunk of electronics. In a side-by-side comparison with its close rivals, the reduced polyphony and limited effects implementation might mean it sounds less impressive initially. However, look beyond those things and you discover the delights of an idiosyncratic but full-sounding, flexible synth with an impressive palette.